Can you believe how fast time passed by? It felt like I just blinked and January is almost over. And due to abrupt changes at the start of the year, a lot of our plans have to be put on hold in the mean time. But that story will be for some other time. Right now, let’s talk about money. This is a simple money saving scheme wherein all participants contribute an agreed fixed amount on a scheduled basis and a participant gets the fund by per schedule as well. This is better explained here. I joined the paluwagan at work in 2012, I think, and I have been part of it every year since then. The funds I get every time I am scheduled to receive it have helped with some of the big expenses I’ve had since I started. This year, I am hoping to not spend the money I get from this activity and add it to my investments. 3 years ago, I tried the famous 52-week challenge. I started with a base amount of Php50 but whenever I have extra cash, I added it to the pot. I never got to finish the whole year due to an unforeseen big expense by middle of that year. And I was relieved that I had that money saved which was a huge help when I needed it. What I liked about the 52-week money challenge was the discipline that I needed to enforce on myself in terms of my spending habits. 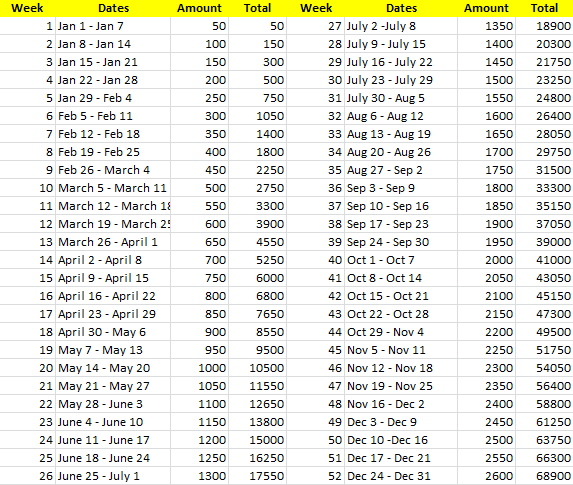 It also challenged me to look for other income streams just so I can keep up with the scheduled savings amount. This challenge is something that I would recommend to singles because of the discipline that it teaches. The thing is, at the start of the year, we are so good at making resolutions about trying to save but by the middle of the year, we forget about it and just spend our money mindlessly. This challenge will keep you in line and on your toes because as the year progresses, the amount you need to save increases. It gets harder but the reward is definitely worth it. One of my mommy blogger friends, Jhanis of themissusv.com, recently posted the challenge that she and her family have decided to do for this year. It is flexible and really doable too. All you need is a piggy bank, a print out of the template then start saving and shading. This one looks fun to do with the whole family, too. Go read on about it here. There was this girl who trended last year for being able to save about Php 40,000 in just a few months. What she did was to save all 50-peso bill she got. It was so inspiring that I tried it out late last year. I started giving my 50-peso bills to Z to shoot in his moo bank (what we call his coin bank since it is in the shape of a cow) instead of coins. I also added 200-peso bills into the pile since I rarely get this denomination. 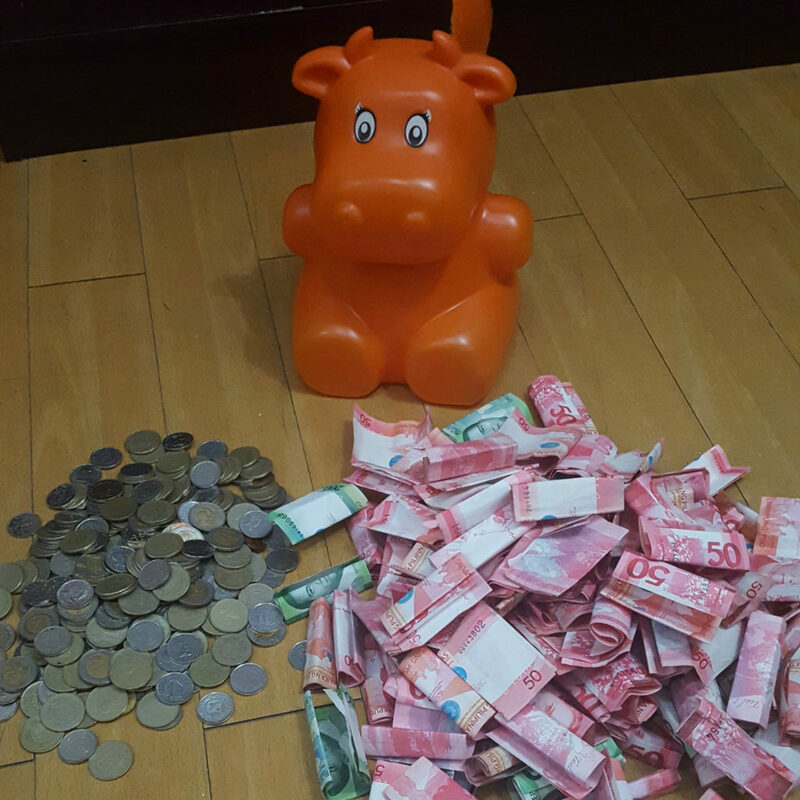 It wasn’t much but when the moo bank was full, we were able count almost Php11, 000. Not much but not bad for a late start. Another blogger friend of mine, Celerhina of ReigningStill, did this challenge last year and used the savings for Christmas expenses. You can read her story here. I decided to do this challenge again this year. The habit of not spending my 50-peso bills has already been formed that it makes me think a lot of times before spending any of it in my wallet. This includes 200-peso bills, too. Z and I already have a new moo bank to fill this year. My sister is doing the invisible 20 version. So this need not be only for 50-peso bills. Check your finances and find which one will work for you. You could do invisible 1,000 for that matter. At the end of the day, the goal is to start saving and having money saved at the end of the year. What about you? What have you decided on for your ipon challenge 2018? Do share in the comments. We’re also doing the paluwagan with my hubby’s officemates. So I think d na talaga kami kakain. Hahaha Thanks for shoutout! I wasn’t succesful with the 52-week challenge and this year we have started the Invisible 50. It’s just been a few weeks and I’m so happy seeing those 50 peso bills in my glass jar. I like the idea of including the 200-bill. Nice. Ma-try din nga. try ko yung reverse 52 weeks. ngayun yung malaki habang may naiwan pang budget from last year. Let’s go washing machine!